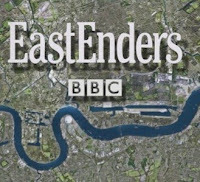 'EastEnder's Roxy Mitchell dresses as her sister Ronnie in a desperate attempt to woo Jack Branning. The barmaid - whose sister is dating Jack, the father of Roxy's baby daughter Amy - is desperate to reunite with the nightclub owner, so decides to borrow Ronnie's clothes in a bid to make him notice her. Rita Simons, who plays Roxy, revealed: "She's dresses up as Ronnie, and even sprays her sister's perfume all over herself. "He's absolutely horrified, and physically pushes Roxy away from him. He really hadn't realised Roxy was crawling all over him. I reckon this is the slap in the face he needs - it finally makes him see that Roxy's brazenly trying it on with him, and he goes beserk." This is not the only embarrassment forthcoming to Roxy. She attends a birthday party in honour of Dawn Swann at the Queen Vic pub, and then decides to ask a group of regulars to join her in the flat above the pub for a game of spin the bottle. Rita explained: "Roxy gets roaring drunk and ends up vomiting all over Bradley Branning. Jack walks in to find her slumped on the floor, and has to carry her to bed. She's lying there in a state with sick in her hair, and asks Jack to join her in the sack - before telling him she loves him!"